Everybody worries. Some more than others. Some have reason to do so. Some do not. But under the hysterical sheen of the surface lies a deep sadness and hatred—yes, hatred—of knowledge. If we were all ignorant to all things, we would have no stresses. But if one was to attain the front-to-back knowledge of his bodyworks, how could he not go insane? How many panic attacks has WebMd.com caused since its launch? Most likely, the number is comparable to the number of lives its helped. Famous men and women in history have suffered from hypochondria: iconoclasts like Andy Warhol, authors like Marcel Proust, men of science like Charles Darwin. 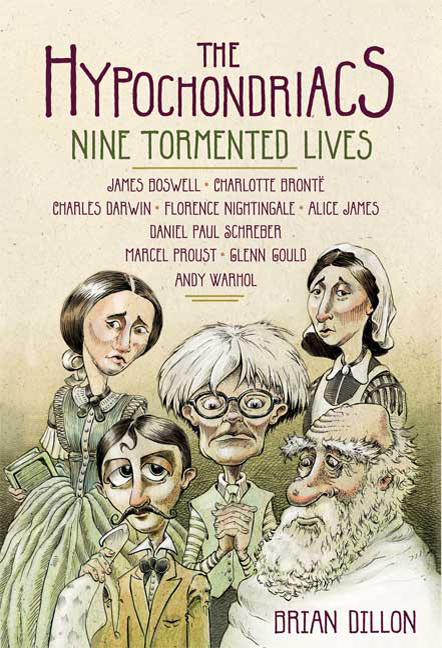 Irish author Brian Dillon’s new book, “The Hypochondriacs: Nine Tormented Lives” (Faber and Faber), analyzes nine historical figures—Warhol, Proust and Darwin, but also James Boswell, Charlotte Bronte, Florence Nightingale, Alice James, Daniel Paul Schreber and Glenn Gould—and their varying degrees of consuming psychological illness. Dillon doesn’t poke fun at his subjects; quite the contrary, actually, as at times he’s in agreement with their worries. But his book is no research paper either, as its littered with humorous anecdotes and factoids, the sort of things only fit for the secret lives of the famous. Dillon manages to explain to us so well even the most absurd beliefs that some of these people had—how master pianist Glenn Gould was certain a tap on his shoulder cost him his ability to play; how the German attorney Daniel Paul Schreber was convinced little men had invaded his body and worked to destroy his spinal cord—without the mocking judgment you might expect, but rather an aching sympathy. While Dillon might not be able to convince you of some of his subjects’ more extravagant “illnesses,” he certainly is capable of helping you understand why these unfortunate few had their own insurmountable fears. The sadness here, the overwhelming realization, is that Dillon’s subjects were never equipped to live in this world, where most fortunate folks can give and take away leverage to and from the worries that enter their minds. Hypochondria allows its sufferers to pull back from the world around them, to disengage from obligation, responsibility and emotional attachment. Seclusion, physical and emotional, isn’t uncommon, which in some ways makes hypochondriacs impossible to entirely know. Andy Warhol was born into a psychology of sickness. Broken bones, mysterious illnesses, scarlet fever, tonsillectomy—all before he was 8 years old, and then came the annual nervous breakdowns that “always started on the first day of summer vacation.” He would obsess over his weight and acne. He wore a gray wig in middle age to give the impression to strangers that he was older, because “When you’ve got gray hair, every move you make seems ‘young’ and ‘spry,’ instead of just being normally active. It’s like you’re getting a new talent.” These specific details, and quotes that come directly from the patient’s mouth, are what make Dillon’s book so fascinating and frightening at once. Of course, hypochondriacs all fear death, and this ultimate concern is not necessarily irrational. If you haven’t heard, we’ll all die someday; when death comes, or any illness for that matter, hypochondriacs enjoy vindication, perhaps occasionally even reveling in it. Alice James, another of Dillon’s subjects, is eventually diagnosed with breast cancer after a short life of fear, torment and “nervous trouble.” She spent the majority of life as an invalid—James was simply unable to live, and at 42, she stopped. When she was informed of her cancer, she wrote, “It is the most supremely interesting moment in life, the only one when living seems life, and I count it as the greatest good fortune to have these few months so full of interest and instruction in the knowledge of my approaching death,” as if the end was a relief. Dillon understands his subjects’ motivations and impulses, which makes this book much more than an amusing timeline of worries or a dry and depressing catalogue of ailments. The stories herein aren’t happy ones, make no mistake, and the author’s compassion leads to a bittersweet affair, and a book that, despite its premise, breathes deeply with perfect health.